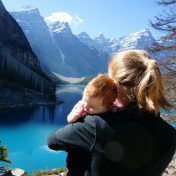 With baby H at just 3 and a half months, myself and 3 of my mommy friends (babies in tow) decided to attempt our first hike… how Canadian are we! We packed into two cars and headed for the mountains… to Canmore to be specific. We decided to hike up to Grassi Lakes. We knew that there were two route options so we could decide how we were feeling and what things were looking like when we got there. I must admit I am using the term hike slightly loosely here; it was a slightly more of an steep walk! Once in the parking lot we decided to take the wider trail up because we were wearing backpacks and babies! I was wearing my Bjorn carrier and the other mommas were rocking out in their Ergo carriers (I have since purchased a lillebabe carrier). All of these carriers have been great, just depends on what you want. I will be sure to post more about carriers at later date! It was very fun to see everyone’s expression as they saw these four moms walking along with their babes! We received countless smiles and positive comments. It was the perfect temperature for our first hike as it wasn’t super warm (having those little heaters on your chest can get a bit toasty), but not freezing cold. We made sure to choose a hike we knew and dressed in layers! I think these were key elements in making it a successful day. Once at the second lake I thought I thought I smelt something slightly suspicious coming from my sweet baby H… sooo all moms on deck and it was diaper changing time. I there down a change pad on a bench, got out the diaper and wipes then it happened… like something from a movie… just as I was taking baby H out of the her carrier she spit out her soother. Simultaneously all of us moms cried out “no” and reached out. The soother happily bounced along, under a root and plop… right into the lake!!! All three moms turned to me with the most sympathetic looks… but I only had a smile… Mom win… I had an extra soother with me! Mom win! Feeling rather proud of ourselves, we decided to go crazy and try go out for lunch. We went to one of my favourite restaurant, The Grizzly Paw, in town. Being that it was mid week and later the afternoon, there was lots of room for us. I would not recommend doing this during the weekend or at any peak time. We literally took over the upstairs! It was rather funny that 4 ladies with 4 babies would take up so much room. It was a great lunch! We all managed to eat without inhaling, had some great laughs and didn’t have any meltdowns (fresh air for the win!). At one point we had one baby sleeping in her car seat, one mom changing her baby in a booth, another feeding her babe a bottle and another snuggling her little one. Setting off for home we were feeling rather smug… look at us spending the entire day doing things we would do without a baby… then Karma hit. I forgot the golden rule… taking my time. Baby H was not a happy camper on the way home. I had a feeling she would need to be fed but instead I thought I would push it… oops! Fortunately I had a very understanding mom and babe with me so it took us a rather long time to get back home, but we made it and despite the tiny blip heading home, it was a wonderful day! Mirror on the back of the seat to see little baby H when she was freaking out!